What does it mean to be a misunderstood, visionary artist and how does suffering for your art impact those you love? These are the themes of Stephen Sondheim (West Side Story, Gypsy, A Funny Thing Happened on the Way to the Forum, Sweeney Todd, Into the Woods, et al.) and James Lapine’s thoughtful and moving musical, Sunday in the Park with George, at the Guthrie Theater through August 20. The musical is inspired by the famous pointillist painting, A Sunday Afternoon on the Island of La Grande Jatte, by Georges Seurat. Sondheim and Lapine won the 1985 Pulitzer Prize for Drama for the play. 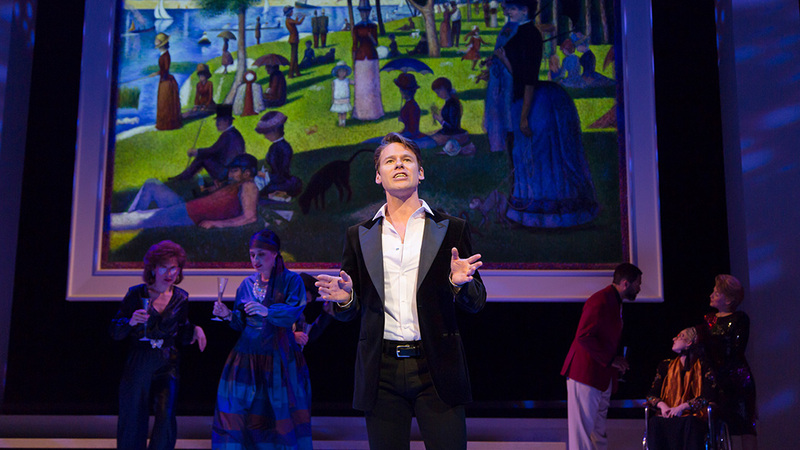 This production, directed by Guthrie’s Artistic Director Joseph Haj, features a stunningly simple set, an impressive onstage orchestra and a hugely talented cast–most notably, Randy Harrison, as Georges Seurat, and Erin Mackey as his love interest Dot. The plot revolves around George, a fictionalized version of Georges Seurat, who immerses himself deeply in painting his masterpiece, and his great-grandson (also George), a conflicted and cynical contemporary artist. The musical follows George and his lover, Dot, as they navigate the Parisian social and artistic scene. The second act switches to the 1980s (you’ll love the hairstyles and fashion) as George, the great-grandson, struggles to find his place in a modern artistic community that values “success” and profits. Supporting characters are the subjects in the painting and their backstories. The dramatic tension isn’t found in obvious story arcs: it plays out subtly in the characters’ struggles to connect with each other; to understand artistic obsession; to find harmony, balance and light in the everyday life and, finally, in understanding the role love plays in art. For such lofty themes, there is much humor to enjoy in this play. T. Mychael Rambo and Emily Gunyou Halaas are adorably funny as the southern “Ugly Americans” visiting Paris. Cat Brindisi and Christian Bardin are suitably silly as man hunters. The musical number, “It’s Hot Up Here,” imagines the characters in Seurat’s painting as they pose uncomfortably in the painting and sing about it. But Harrison and Mackey anchor the musical with their heartfelt portrayals and beautiful vocals. Harrison, in particular, with his impressive vocal range and willingness to go for broke in showing us George’s obsessive focus on his art–“Finishing the Hat” comes to mind. This is a musical tailor-made for the sophisticated Twin Cities theatergoer: iconic art pieces; a meditation on connecting with art and people; beautiful costumes; humor with a sly nod to the necessary evil of corporate sponsorship and a largely locally trained cast of favorites. Sunday in the Park with George, music and lyrics by Stephen Sondheim, book by James Lapine, directed by Joseph Haj. Conducted by Mark Hartman, scenic designer Jan Chambers. Now through August 20 on the Wurtele Thrust Stage. 818 South 2nd Street, Minneapolis. Tickets at the Guthrie Box Office at 612.377.2224, toll-free 877.44.STAGE, 612.225.6244 (group sales) and online at http://www.guthrietheater.org.